This interactive, full-day workshop provides a professional development opportunity for teachers interested in leveraging the Hood's resources to support their curricular goals. 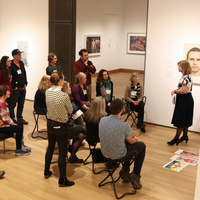 Hear about the Hood's new thematic tours and sample strategies to promote learning across cultures and disciplines. Fee is $35, and registration is limited to 20. For details, visit the museum's online calendar. To register, click here by March 24.